Our baby shower cake made by Juanita from Sweetthings.ca! I wanted to avoid the whole “group of women that don’t know each other and everything is incredibly awkward” party, so I resisted letting anyone throw me a baby shower for the longest time. We eventually decided to have more of a party slash baby shower and celebrate this moment with our close friends. I am so glad we did! The shower ended up being a lot of fun and hopefully we started a trend in awesome couples’ baby showers! The party was full of good friends, family, and incredible food. I wish I had been able to find my camera, but days of searching for it turned up nothing! I have no pictures of our delicious spread but I do have pictures that a good friend took of the event, so I am thankful for that. The best part was that Yuri and I got to share the special occasion together, and opening baby gifts with 25 people staring at us was a little less stressful for me! I SO do not like being the center of attention, unless I have a drink of courage beforehand, and there was no going that route this time! In fact, if we have 4 kids like I’ve always wanted I won’t be having a drink for about 8 more years! Me explaining what the hell a Twirly Whirly is to Yuri! I loved having all of our close friends and family here – guys and girls – and I think everyone had a good time. Tamara made every couple a Christmas stocking with some goodies and a baby bottle for everyone to drink out of for the evening! So cute. She provided us with dinner and the tastiest carrot cupcakes ever! 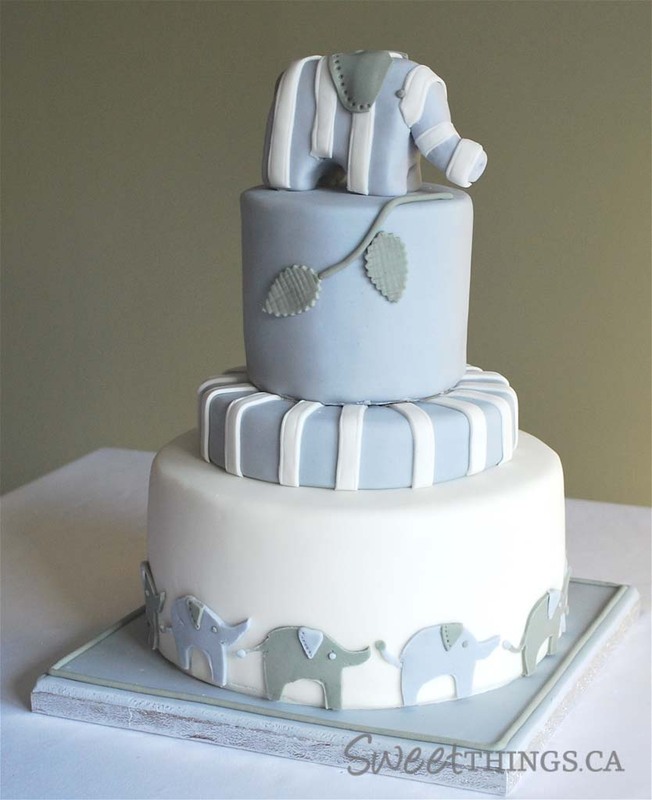 Yuri and I ordered a special elephant cake to go along with our baby’s elephant themed room that we’re planning in the new house and everyone got delicious Felix and Norton cookies to take home! I have to admit, shower games were probably the part I was dreading the most about a baby shower, but they were fun and didn’t include anything along the lines of “guess how big mommy’s tummy has gotten!”. Tamara planned 2 games and even had special cards made for them. In hindsight, I wish I’d had someone take a picture of them! Oops. They were something along the lines of “Guess this kid’s celebrity parents” and “Multiple choice about the parents-to-be.” Good times. Other than that the night was about having a good time with friends who will be there to watch our baby grow. For the longest time I had thought about it as a party, so it was a bit shocking when we ended up with so many presents! Thank you everyone!